Hi there, folks! In keeping with our summer theme — we’ve been talking up the Olympics, in case you haven’t noticed — today I’ll be taking a look at some travely-types who have performed what can only be described as Herculean endeavors. Which one of these travel worthies would you vote onto the gold medal podium for their efforts? Register your choice in our poll below. The 30-something Norwegian Gunnar Garfors (he’s a tech and new media guy as well as an avid traveler and former footballer) will never forget where he was on June 18th, 2012. Because he was in Istanbul (Asia), Casablanca (Africa), Paris (Europe), Punta Cana (North America) and Caracas (South America). Yup — all of ’em! He managed to create a new world record by visiting five different continents in one day! Although the “day” was quite a long one, as Gunnar used the advancing dateline to squeeze a few more hours into his schedule. Montrealer Jean Béliveau took a little longer to accomplish his feat than Gunnar Garfors — because Jean walked all the way around the word. No, really! 47,000 miles… It took him 11 years — and 53 pairs of shoes! Jean liked the idea of sailing around the world, but ocean-going yachts cost too much. Instead, he began to imagine running away as far as he could. He started jogging and working out but told no one of his plans — not even his life partner, Luce Archambault. When he finally told Luce, she gave him her blessing — but insisted that he do it for a cause. Jean chose world peace and the safety of children, something no one could disagree with (at that point, he was after some peace of mind). He began by running south, but by the time he’d reached Atlanta, his knees had started bothering him, so he switched to walking. He waked through the rest of America, Mexico, Latin America, Africa, Europe and Asia — six continents and 64 countries. It’s an achievement so staggering it begs the question: what can he possibly do next? Where do you go from there? Another record, of course, belongs to Luce, who has remained loyal to Jean despite his absence of 11 years from their home in Montreal and his falling for a woman in Mexico. Once a year, she would come to him and they would spend three weeks together, in one place. Brendan (Benny) Lewis is a polyglot who hails from Cavan County in Ireland. (No, “polyglot” isn’t a type of glue; it’s a person who speaks four or more languages fluently.) Benny earned this title — he is also a vegetarian and a teetotaler — after nine years on the road, during which he taught himself to speak eight languages fluently (with more than a smattering of half a dozen more). I know nothing about Benny’s musculature, but it’s clear his tongue has gotten plenty of exercise. The British novelist and travel writer Ben Hatch is the author of a hugely popular (and very entertaining) book about a recent adventure of his: driving 8,000 miles around Britain in a cramped Vauxhall Astra, while researching a guidebook for Frommers. Well, there are lots of reasons I could pick: because he practically lived in his car for five months, because he purposefully inflicted dozens of tourist attractions on himself every week, because he had a car crash en route, or because he stayed in a haunted Scottish castle. But the one I like best is the fact that he did all this with his wife and two children — aged four and two! — in tow. Right! There’s my suggestions. What do think. folks? I just know there are loads of people out there making epic journeys, achieving the unachievable, and generally making the rest of us look like couch potatoes in comparison. Do you know of any? (Olympians, I mean, not couch potatoes — I’ve got enough of the latter in my house.) BTW, I toyed with the idea of including an older traveler, as unlike sport, there seems to be no real age limit on world travel, especially with all the recent growth in the international cruise-ship industry (see photo above). And don’t forget to vote in our poll! STAY TUNED for Tuesday’s post on a historical traveler worthy of a gold medal or two. THE DISPLACED POLL: Who will win the Ladies’ Grunt Championship at Wimbledon? Which country produces the people who travel the farthest, the longest — and with the most credit cards? THE DISPLACED POLL: Which of these 4 exotic sports should be part of the Olympics? THE DISPLACED Q: Does living abroad make you more or less patriotic? Our first visit to Paris. My husband and I were very young, and this was our first time abroad. Upon arrival, we took the métro to Charles de Gaulle Étoile, the station closest to where our hotel was located. We walked up the stairs et voilà — there was the Arc de Triomphe just as I imagined it would be, only better. I was stunned. Speechless actually. But I have to say that this still applies. The Arc and the Eiffel still bring tears to my eyes, I’m not sure why. The flowers — jasmine, lavendar, roses — in Grasse, in the south of France. Grasse is considered France’s perfume capital as it produces over two-thirds of the natural aromas used in perfumes. Touring Parfumerie Molinard is an education in itself. I thought I knew scents until I took the tour but then I found out how much more there is to learn! But, you don’t have to be an expert to appreciate the aromas of this area. Just breathe in and enjoy. This is strange — it wasn’t in France! My husband and I had driven from Nice to Sanremo, Italy, just across the border. While wandering through the town, we heard strains of a violin coming from the art gallery (which is what we were looking for in the first place). We went in to check out the art work only to discover the music was “live.” A girl was practicing the violin and she continued to play while we looked at the exhibition. No one in the gallery, which was called Tunnel Dell’Arte, spoke English or French, and our Italian is nil — but we did manage to understand she was practicing for a concert that night. We bought a small painting and the owner mimed that he could send it to us by air (with much flapping of the arms to get the idea across). It’s a toss-up between the hot dogs at Harry’s New York Bar in Paris and a white wine served at a dinner in the Loire Valley (unfortunately, I can’t remember the name). Walking in the Tuileries one day, we came across a man feeding the birds out of his hand. We were watching him when he motioned to me to put my hand out, and he filled it with seeds. Sure enough, these tiny little birds landed on my fingers to have their lunch. This was an amazing feeling. Very delicate, very soft, very special. There is no one particular person that I can single out because we’ve always had nothing but good experiences with people during our travels — I’m remembering, for instance, an entire café full of people trying to find a street address for us. Montmartre stimulates all five senses with the mixture of music, art and restaurants. Further up the hill in Montmartre is the local vineyard, the wonderful restaurant La Maison Rose and the Lapin Agile cabaret, with its fascinating history. I couldn’t go to Paris without some time in Montmartre. I especially like going on a week night, when it’s a bit quieter, and I can picture Picasso, Modigliani or Utrillo sitting at a café talking about art. Bliss. The American pop artist Jim Dine is a favorite. I’ve loved his work for years and have met him a few time at exhibition openings. He is equally talented in printmaking, painting and sculpture. His work is very personal, but the viewer doesn’t feel like an intruder. We travel to open our minds and hearts, and to learn from the experience. For me observation is the whole point of traveling. La dolce vita is whatever you want it to be. Try evenings with a particular country theme — a Spanish night with paella, a Parisian evening with raclette, French wine and music. All the information you need is on the Internet: recipes, lessons for learning a foreign language, instructions for adding a foreign touch to your decor… The possibilities are endless. Susan Ross Donohue is an artist who lives in Montréal, Canada. She makes frequent trips to Paris, a city she considers her second home. 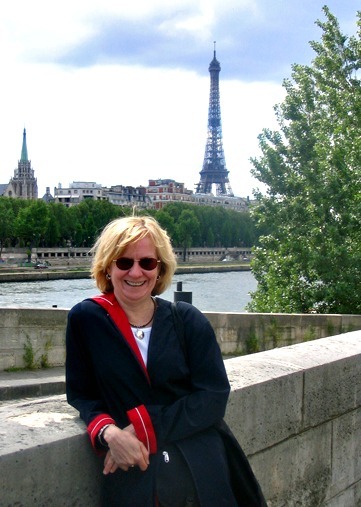 Her travels are recorded in her blog Life, Laughter and Paris, and you can see her artwork — much of which is inspired by the sights and sounds of Paris — at her art site, Susan Ross Donohue. Follow Susan on Twitter (@srossdon) and on Facebook. 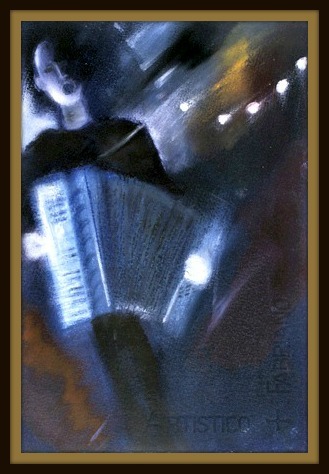 Images: Susan Ross Donohue in her favorite city; “L’Accordéoniste,” one of her paintings.